Wonderfully complex. Perfectly integrated alcohol, tamed, harmonious smoke, sweet hints of honey, plenty of citrus fruits and spices are my first impressions. I like the smoke very much, as the typical "hospital notes" are barely perceptible after plasters and gauze bandages. On the fresh side, citrus fruits dominate, with a tendency towards limes and juicy grapefruit. Due to the Sherry Fassreifung I register sweet, red fruits. Ripe grapes, a hint of raspberries and blackberries are pouring out of my glass hesitantly. 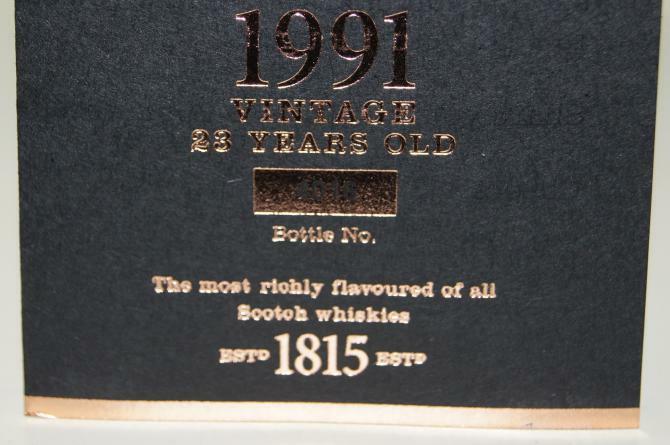 Another contrast is the perceptible spices (cloves & cinnamon) and oak notes. In the background a wonderfully maritime impact lingers. A little kelp, algae and a salty sea breeze complete the extremely complex and always harmonious aromas. Even after half an hour, new impressions crystallize. Simply fascinating and exciting! 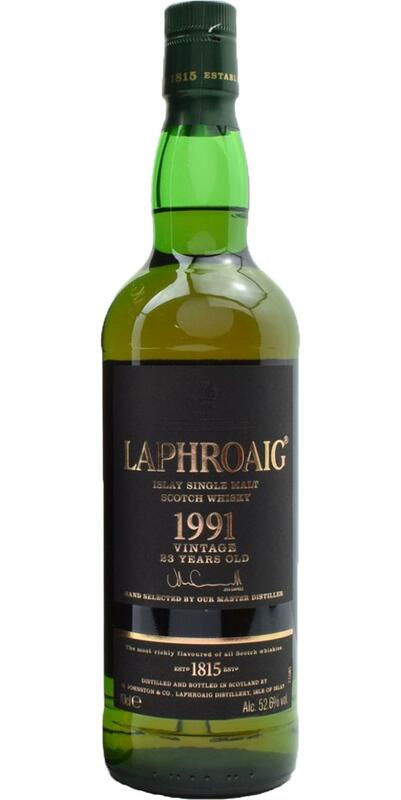 Very oily, soft, cuddly and voluminous, the Laphroaig floods the palate. The spices cause a fine tingle on the tip of the tongue. The pleasantly sweet smoke wets the oral cavity and leaves the sherrylastigen and spicy aromas after a few seconds the upper hand. Ripe red fruits, grapes, cherries, sweet forest honey, a hint of caramel, juicy grapefruit and hints of orange peel form the basic flavor. Spicy oak notes, nuts, leather, herbs and spices (again cloves and cinnamon) intensify and pave the way to the finish. In the background there are always sweet smoke and maritime notes. Salt, seaweed and algae complete the multi-faceted taste experience. Very balanced and harmonious, with perfectly integrated alcohol, which gives the Laphroaig a completely sufficient power. Long and warm. The malt "loses" a little of its sweet-fruity lightness and leaves the dark fruits and distinctive wood notes now the priority. Plenty of leather, herbs and salt are present. The smoke lingers on the finish line rather in the background. At the very end a slight dryness and bitterness on the palate forms. 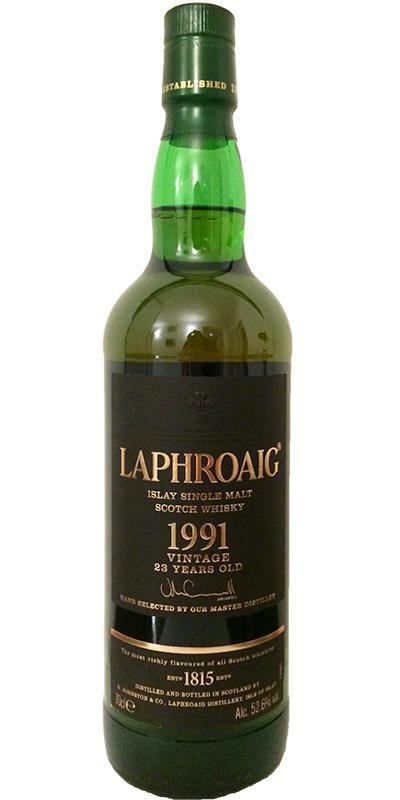 If you leave the prize aside and allow yourself to be completely open-minded about the dram in the glass, one of the 1991s opens up a whole new approach to the Laphroaig Distillery. First impression: wonderful sweetness of ripe red grapes. In the background Christmas spices such as cinnamon, coriander, cloves. Completely subdued smoke, the otherwise otherwise typical for Laphroaig medical sticking note completely missing. Fine spicy, sherry sweet. The spices from the nose waft through the mouth. Every now and then, a small smoky top shows, but quickly returns to the background. Oily leather flavors complete the taste. Over time, the oak claims its space, but without becoming too dominant. The notes are more like an excerpt of what he has to offer. You can always find new combinations of flavors. Gorgeous! I like that better than the 21er FoL. A lot of mixed opinions on this one. For me its a great dram however. It still tastes like Laphroaig and is not overpowered by sherry. Great maturity and balance between the ex-sherry and the refill casks. I find different nuances everytime I come back to it. Also the strength and mouthfeel is perfect. Well, only the price is dissapointing.. The nose is very pleasant, at first powerful, iodine, salty, but after a couple of minutes it becomes very pleasant, envelops in strawberry jam, honey and spices.